Since 1980, Harmony Music 凱聲琴行 has specialized in Violins, Erhu, Dizi, Guzheng and their strings, as well as other accessories. With more than 30 years of experience, we wish to bring you interesting facts, news and instrument tips in the world of music, and spread our love and passion for music thorough our blog. Posted by Harmony Music in Latest News on Dec 13, 2018 . 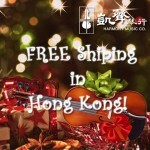 We are happy to bring you free shipping in Hong Kong during the holiday season. Need a last minute gift for children and your music enthusiastic loved ones? Feel free to browse through our selected collection of musical instruments, accessories, and more. For any inquries, call +852-2381-2025 for more information. 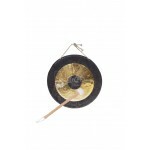 New Chinese Gongs, Drums and Cymbals are now Here! Posted by Harmony Music in New Arrivals on Jul 14, 2015 . Meet our new Chinese Percussion section! We have prepared a selection of our favorite Chinese Gongs, Cymbals and Drums to our eShop, including the Chao Gongs, Hand Gongs, Water Cymbals and War Drums etc! So overseas customers can also enjoy the thrill and oriental atmosphere of this long Chinese tradition. No matter you are assembling a traditional Chinese Orchestra or simply want a taste of oriental culture, these Chinese Gongs, Chinese Cymbals, and Chinese Drums can be a great addition to any collection! Precious moment with our Erhu student! Posted by Harmony Music in Latest News on Mar 23, 2015 . Very happy that our fellow Erhu student, beautiful bride Sammi, shared a precious moment of her life with us! From the Harmony Music family, we wish the couple a lifetime full of love and music! Posted by Harmony Music in Latest News, Music Facts on Feb 17, 2015 . To celebrate the new Chinese Year coming, the Year of the Goat (Goat pronounced as “Yang” in Chinese), we have collected 5 interesting facts about the Yangqin (揚琴) to wish everyone happy holidays from the Harmony Music Family. 1) Yangqin (揚琴) is introduced into China during the Ming Dynasty, the word Yang (揚) is rooted from Yang (洋), which can reference the word “foreign”. 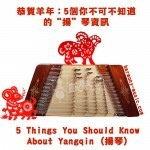 2) Yangqin is originally developed from instruments with various names, including the Psaltery and the Dulcimer. The Yangqin we know today has gone through 400 years of improvement and modification. Posted by Harmony Music in Latest News on Nov 07, 2014 . In respond to popular demand, we have finally revamped our website to provide a more user-friendly interface and better service. We will continue to work on bringing more items from our brick-and-motar store online. Please stay tuned with us and Like us on Facebook to follow our newest updates!